What are the basic ingredients of shochu? Japanese sake is made from rice, just as wine is made from grapes. But shochu (Otsutype shochu) can be made from a variety of raw materials. Each material imparts a different unique flavor and aroma profile to the final shochu. The high-quality ingredients have to be selected carefully and are usually produced in the same region where the shochu is made. Imo shochu was key in helping to make shochu popular throughout the world, and it really created a sales boom in Japan. Imo shochu has a plump fragrance, body (koku), and soft sweetness. If imo shochu is served with hot water, the aroma of the main ingredient can be enjoyed even more. Mugi shochu is aromatic and flavorful (umami.) Depending on the distillation method used, the taste can vary from very light to mild. The barley used is usually polished to 60-65% of the original size to make shochu. Sometimes mugi shochu that is aged in the cask tastes like an aged single-malt whiskey. Kome shochu is the original historical shochu. Kome shochu started being made at the same time that rice farming became popular in Japan. Kome shochu has a rich aroma of grain and a lightly refined sweetness similar to that of Japanese sake. It is made with table rice or sake rice (sakamai) which is used for Japanese sake making. Kokuto shochu is a specialty product from the Amami Islands which are close to the Nagasaki prefecture in Kyushu. The law used to forbid anyone from making shochu from just any sugar. It allowed only the cane from the Amami Islands until 1953, when the islands were returned to Japan from America. The law was changed to reflect changes in the customs and history associated with the making of kokuto shochu. This shochu has the unique aroma of sugarcane. It is very popular with women because of its clean, dry taste. Awamori is a unique shochu from the tropical island of Okinawa. Awamori is distinct from other Otsu shochu. Shochu usually has two brewing processes before distillation, but Awamori needs only one because of the weather on Okinawa. Okinawa is a very hot island, so the product has to be protected from decomposition and bacteria. As a result, only one brewing process is used. Awamori has a deep fragrance and body. Awamori tastes much milder if it is aged for a longer period of time. Sometimes Awamori is aged under the sea. A water depth of 10 meters provides an ideal environment for preservation because it provides very low temperatures and cuts off sunlight. Soba shochu has a fruity aroma and a unique sweetness that lingers on the tongue. Compared with other shochu, soba shochu does not require an acquired taste, so it is popular with many people. Soba shochu contains dietary fibers that remove cholesterol from the body, making it extremely beneficial to human health. 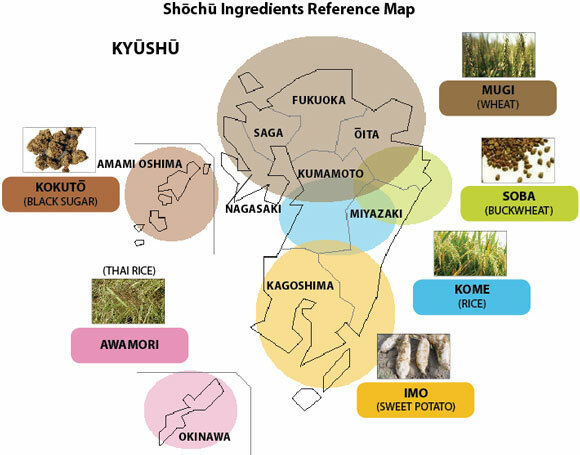 There are many other ingredients from all over Japan used in the making of shochu.